And more (freaking amazing) cables! Holy cow, are my fingers itching to start knitting up these projects. Do you think I could finish that dress by the time fall rolls around if I start now and skip stuff like going to work and sleeping? Maybe. Are your fingers itching to cast on, too? Well, today’s your lucky day! I’m giving away two (count ’em, two!) copies of Twist and Tweed– one e-book and one paper book– to two lucky readers! Want to enter? Just comment below with your favorite autumnal activity! I can’t wait to read all about apple picking and cozy blankets and imagine that I’m back in autumn! This entry was posted in About the Blog and tagged giveaway, knit picks, knitting, pattern, pattern book, twist & tweed, Twist & Tweed: the Fall 2015 Collection Twist & Tweed: the Fall 2015 Collection, twist and tweed on August 3, 2015 by onemilljellybeans. I look forward to walking at the arboretum down the vale full of all the Maple varieties to enjoy the foliage. Ooooh I just love cables! I think my favorite thing to do in autumn is to throw on a cozy shawl, cue up some soft music on the stereo, brew up a pot of Cranberry Autumn tea and sit with my knitting in a comfortable chair. I live in the desert, so fall means finally being able to spend time outside without melting. Not melting = my favorite part. Our area has a Covered Bridge Festival every year in October. Lots of crafts, pecan cinnamon rolls, pumpkin ice cream and apple dumplings, and, oh yes, covered bridges. It’s a great time to be outside in the crisp, Fall air. Gathering corn stalks, pumpkins and gourds to decorate the front porch. Enjoying my coffee on the porch with the smell of freshly fallen leaves and morning dew. Taking it all in because to soon it will be covered in a blanket of white! My favorite fall item used to be going to farmers markets and getting the hot out of vat of oil donuts….yummy….Can’t find them in FL so I settle for trying ever pumpkin flavored treat out there! I like when it gets cool enough to take long walks with my dogs. And being able to wear some of my knitted items! My favorite thing about fall is the clothes – I’m much more of a cool weather clothes person than warm weather (which is probably why I love to knit). Autumn means longer hikes with my daughter and then coming inside for hot apple cider. It also means harvest festivals aplenty in our rural community. Looking forward to knitting in front of the fire while camping in the bush! And being out of the city on those beautiful fall days! Curling up after a buys school day with a cup off tea and a book! Or a cup of coffee and some knitting (most likely socks). 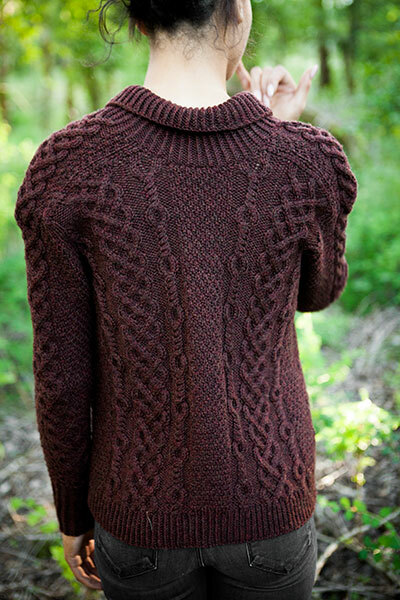 Love cables and love these designs! In addition to cozy fall knitting, I love picking out pumpkins at the pumpkin patch. A couple are for decorating and/or jack-o-lanterns, and a couple are destined for pie. Love it! It’s all about cozying up in warm sweaters and reading for me! It’s almost too hot to think about fall! My favorite part of fall is Halloween – all the fun planning & gathering of costumes, then the excuse to dress up and eat candy! My favorite fall activity? It’s gotta be taking a walk and kicking the fallen and piled up maple leaves, hearing their crackly rustling and smelling the dry earthy smell of fall… To top it off, it’s still fun to pile them up and jump and burrow into them – just as I did as a kid, much to my hard-working father’s consternation! Walking in the woods. That crisp fall air cures a lot of ills. My favorite autumn activity has to be pumpkin picking and carving them after. It’s a nice creative outlet and I enjoy doing this with my family. Last year, I made a Harry Potter pumpkin and my sister made Oogie Boogie (from a nightmare before Christmas). Came out great. I live in San Francisco, where the seasons all tend to blend together, nearly indistinguishable. So for me, the most exciting thing about fall is that it’s celebration season: the birthdays of almost all of my immediate family AND my anniversary. So many parties! knitting on the deck; watching the leaves fall. My favorite fall activity is going to my local sheep farm and help the farmers shave the sheep! Another one is just collecting leaves and fall flowers with my little cousins and book pressing them.